British actor Idris Elba has optioned Poe Must Die by Marc Olden for three feature films, according to Publishers Marketplace. 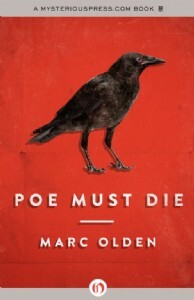 Marc Olden's POE MUST DIE, optioned to Idris Elba's Green Door Production Company, to be split into three feature films, by Dana Spector at Paradigm, on behalf of Liza Fleissig at Liza Royce Agency. It is said that beneath Solomon’s glorious throne, books were buried that gave the fabled king control over life, death, and demonic power. The throne has been lost for millennia, but now one man seeks to find it, and harness its secrets to unleash hell upon the world. Jonathan is the most powerful psychic on earth, and in service of his god Lucifer he will tear civilization apart. To combat his dark designs, mankind’s hopes rest on a half-mad alcoholic named Edgar Allan Poe. In the shadows of New York City, Poe drowns his talent in rotgut gin, trying to forget the death of his beloved wife. A bare-knuckle fighter named Pierce James Figg arrives with a letter of introduction from Charles Dickens, to beg Poe’s help chasing down the power-mad devil worshiper. Writer and fighter will stand together, to save humanity from a darkness beyond even Poe’s tortured imagination. Click here to buy it, so you can say you knew about it before it took off!